Raider must of been a pirate in a former life, as he has a sense of adventure! Raider enjoys new places and wants to explore everything. His swash-buckling ways started when he wanted to conquer the front seat - so he climbed over and had half of his body in the front, and the other half in the back. He enjoyed the view, but the passengers in the truck, not so much. Raider tends to do it his way and will pull, so he needs some work on how to behave on a leash. 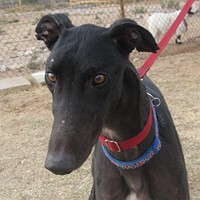 Raider also has some energy to share and would love a good romp in the park or with some toys.